I drove to North Wales last night after a long week at work, to spend the weekend cycling with Ryan. Now for a great weekend ahead with 2 days of long distance routes and some good up-hill climbs around Snowdonia. Today we’re doing a route that is roughly 40 miles each way to Abersoch and back, roughly 80 miles in total. Nearly 5 weeks to go until the Switzerland trip! Yesterday was my first ever solo long ride. The plan was to cycle the 78 miles from Dewsbury to Nottingham city centre via Barnsley, Rotherham, Chesterfield and a few more towns along the way. After setting off at 7.30am I was in high spirits, feeling really optimistic about the route ahead despite the persistent rain and grey sky. I’d mapped my route using Google maps and had deliberately tried to stay on cycle routes for the majority of the ride, with the logic that I’d build up more speed when there was no road traffic involved. Oh, how wrong I could be. The Trans Pennine Trail that ran down the side of Barnsley, The Dearne Valley, was far better suited to mountain biking. The majority of the trail followed the disused Barnsley canal, and the trail can’t have been more than a metre wide, and in some areas it was flanked by barbed wire on one side and a wooden fence on the other. This made my average speed drop drastically. After being so desperate to stick to cycle routes whilst planning my route, I was shocked when I wanted to join back onto the A roads again. Navigation wise, there were quite a few hiccups. I found it a lot easier on the roads, when I could remember street names and would recognise buildings and landmarks I’d seen on Google street view. However, my biggest mistake was the realisation that although I may be on the right road, granted, those roads go in 2 directions, and I may well be taking the wrong one. I learnt this on Rotherham road. Turns out I was cycling 2 miles in the wrong direction before I stopped and realised . Heading North instead of South it was a nice little 4 mile detour, I fancied the scenic route. Considering that the previous time I’d been out, with Ryan, I’d still found roundabouts a little daunting and cars entering made me quite on edge…this journey was quite positive. I found that my confidence on the roads was building and I felt very sure of myself when signalling and making sure I was safe. I just kept Ryan’s very good advice in my head the entire time : “Act like a car”. This worked on junctions and at traffic lights, and by keeping a more dominant position amongst the traffic I didn’t feel bullied into the curb. There were, however, a few morons overtaking me at high speed on blind corners on country lanes, but you know morons will be morons. The first “drama” of the day came in the form of a loose bottle on my first fast downhill descent. I hit 30mph and all of a sudden heard a loud crack. 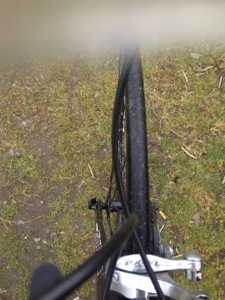 My first thought was that the back wheel had fallen off…but then I was still rolling on down so assumption number 2 was confirmed when I looked down and saw that I was one water bottle down. 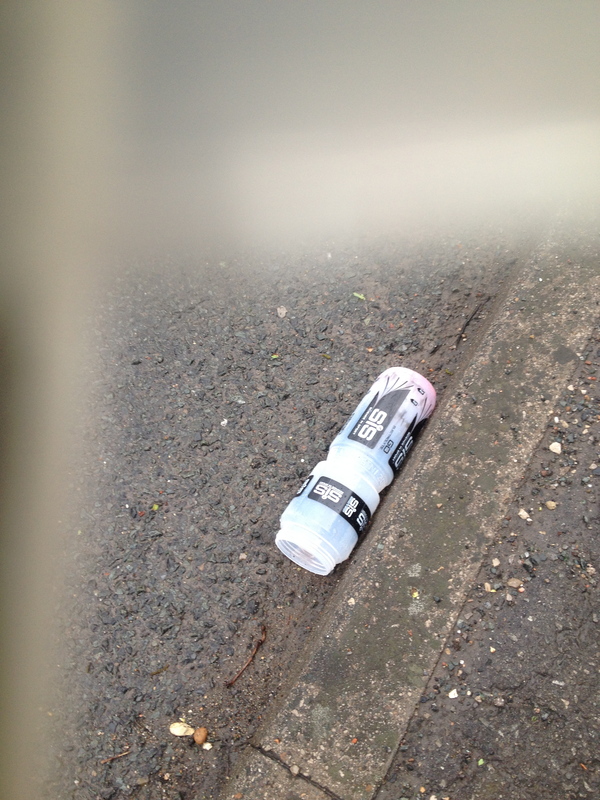 I pulled over and wandered back up the hill to find my new SIS water bottle laying empty on the side of the road. I still had 70 odd miles to do with about 100ml of water to guzzle. Only a small dilema obviously, as I would see many shops along the way, but it made me laugh all the same as ryan had told me a similar story that happened to him a while back. The main drama of the day , which ultimately made me have to cut my route very short, was the draining of my iPhone battery. Mum had persuaded me to leave Google latitude on , so that she could track my progress throughout the day and not have kittens when I didn’t text to update her. This, unfortunately rinsed my battery, even though I turned it off after a couple of hours , realising that was the cause, it was already too late. I couldn’t navigate without the use of my google map app and felt really unsafe riding through woods and secluded roads without the use of phone in an emergency, so I started to worry about what to do . I was on the trans Pennine trail through Rother Valley national park when my phone died, and although feeling quite uncomfortable I knew i’d find someone to ask for directions to a shop or cafe or something . 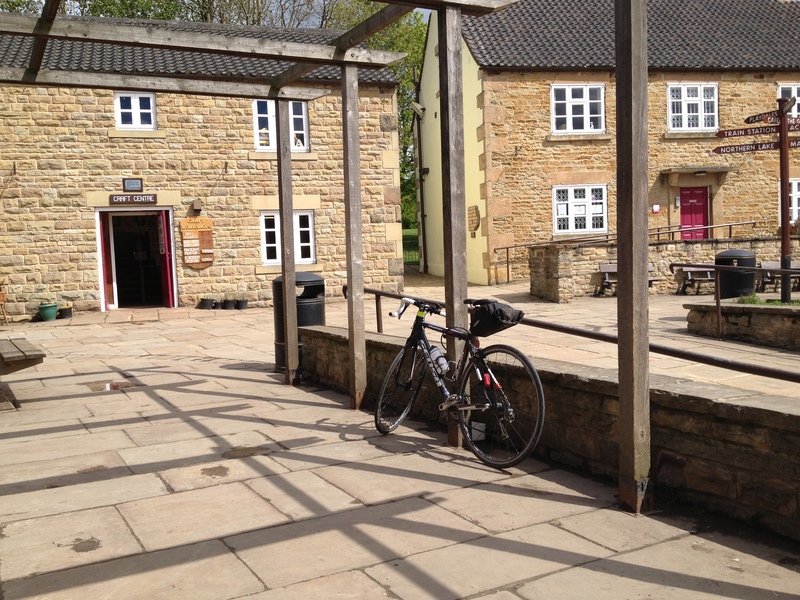 I came across the Rother Valley Activity centre, and after speaking to some very helpful people I ended up at the centre’s cafe asking for help. The Lovely staff in the office offered to charge my phone for a short while before they closed, which was a huge relief! So in true Jen style I got myself a cup of tea and some biscuits whilst I waited, and the sun began to shine..so It was a huge shame I wasn’t on my bike to enjoy it. Rocking up in a high vis vest covered in mud I received a lot of interested questions asking where I’d come from , what my route was, questions about my road bike. One guy asked if I’d been doing bunny hops in swamps….I certainly looked as though I had been. Half an hour later my phone had 30% battery, enough to ring mum and whinge about my situation and ask what I should do. I really wanted to press on and reach Nottingham but time had gotten away from me and it was getting later and later, and my phone battery was never going to last, especially as the remainder of the route was going to be even more challenging and complex navigation wise. So as disappointed and gutted as I was, I decided the wise thing to do was to cycle to a train station and get to Notts by train. 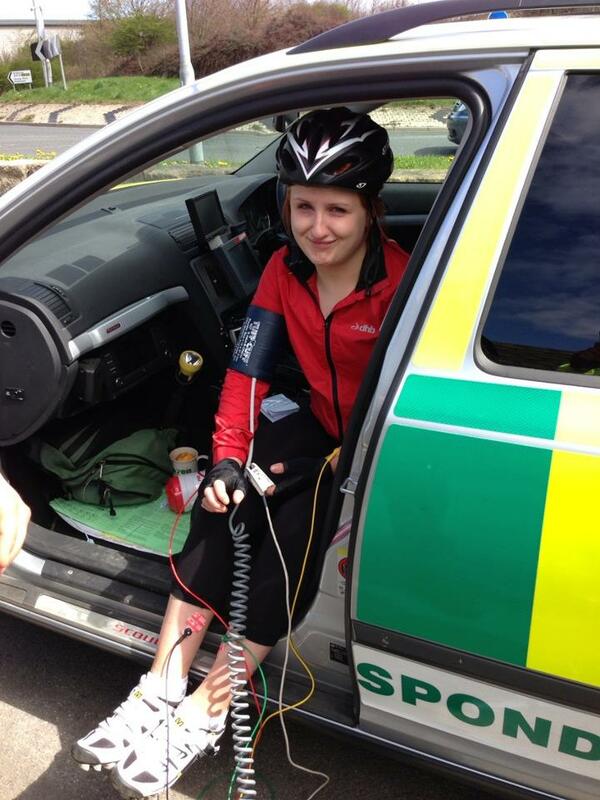 Cycling 54 miles in total, It’s the furthest I’ve gone alone and had to navigate by myself. I found navigating very challenging but at the same time I felt like I was getting the hang of navigating roads as the day progressed. Overall, I’m happy with how it went even though there were ups and downs , but I’m making the most of it and there’s definitelylessons to be learnt. One thing to note aswell, my stamina and “all day pace” as Ryan calls it were on top form, although I do need to learn when to eat and regain energy as I did flag a couple of times. Concentrating on navigating and reaching the next towns distracted me, so lesson to learn. Til next weekend and a long ride in Wales with Ryan! On Sunday Ryan and I woke up at 7am to set off to cycle to Rochdale and back , and get back home in time for our family roast dinner at 4pm . This was more than enough time for Ryan obviously , but factoring in my navigational skills, a few wrong turns and some initial screaming and nervous yelps on roundabouts it ended up taking us roughly 6 hours . 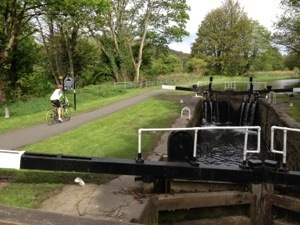 The route was pretty decent for the first 20 miles , heading along the cycle way, however once into Calderdale the standards of the cycle routes quickly deteriorate . Lots of potholes and cobbled pathways under bridges about a meter wide … Twice Ryan was convinced I was falling into the canal . I know what he would do . Along the way we were met by lots of wonderfully considerate pedestrians , other cyclists, as it was a popular cycle route, and also some crazy dogs that threatened to dart across your path at any moment . A loose boxer dog at the edge of the canal is really quite intimidating . 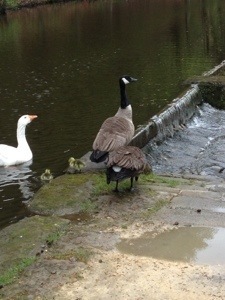 What’s even more intimidating is cycling past a new mother goose and her ducklings … We had some very over protective, angry geese hissing at us as we went past . The rainy , muddy cycle ways were also a hindrance on our average speed and timings . 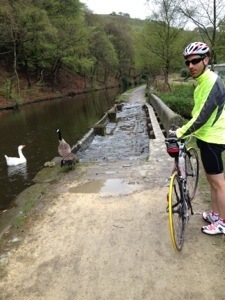 Along the canal at one point we were getting off the bikes every 3 minutes to carry them over running water . ( Ryan has photos in sure he’ll blog them). 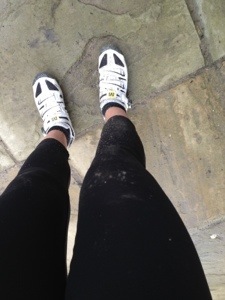 This , ofcourse, made me very muddy … As my wheels were kicking up a load of mud and water up my back and legs. Overall , it was a successful ride , considering the 55 miles ended with a steep uphill climb for 2.5 miles . Ryan said that I climbed it at a consistently faster pace compared to last time and I now feel my confidence building back up after last weeks badger of a ride. Hopefully this’ll make navigation easier and time effective . Last weekend was less of a Team Training event then a Team Fail, after I was too ill to cycle and Megan realised in an all too painful way that for some motorists we cyclists are wearing invisibility cloaks. I would say that the weekend started off well, with a stress free and optimistic train journey north with my bike, but I’d be lying. I feel I should clarify this post by highlighting that not all train companies hate cyclists, and that at least they’re trying…but I’d rather just moan about how horrible the whole experience was. Online booking? What is this, the 21st century? To reserve a space for your bike on a train (essential as they only have space for three bikes on every train and only two are bookable) it would be nice to simply click a button whilst booking online which said “Bike reservation required”. 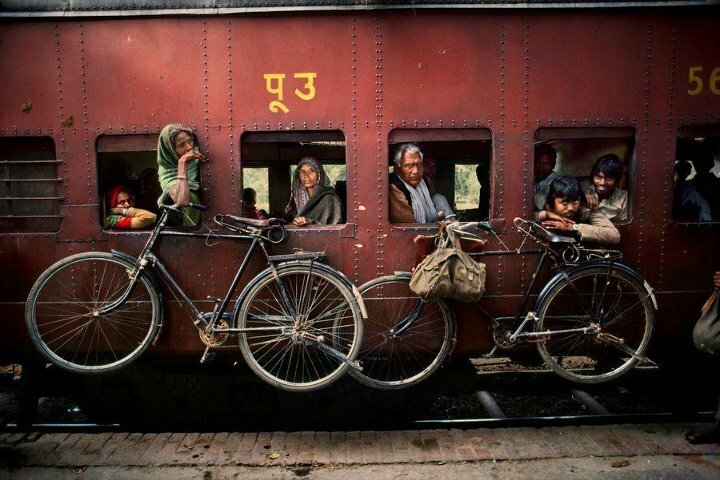 But perhaps this is too much like hard work for the train companies to manage. Luckily both trains I needed to catch to get from Oxford to Leeds were run by the same company, so I only had to phone up once to book a space. Can I just put you on hold for a moment? I don’t know why this particular train company doesn’t allow online reservation for bike space (though none of them do as far as I know) and then insist you phone up to a line that only works Monday-Friday 9-5. So I found myself using my break time to stand outside the office and speak to a customer service adviser for 30 minutes to book my tickets and bike reservation. I was put on hold twice, for 5 minutes each time, while she went off to first check that there was availability for my bike, and then to book it for me. I wasn’t happy about reading out my card details over the phone, in the middle of the street but she refused to let me reserve a bike space without booking my ticket as well. Never having travelled alone on the trains with just a bike for company, I noticed a few things I would not have noticed before. 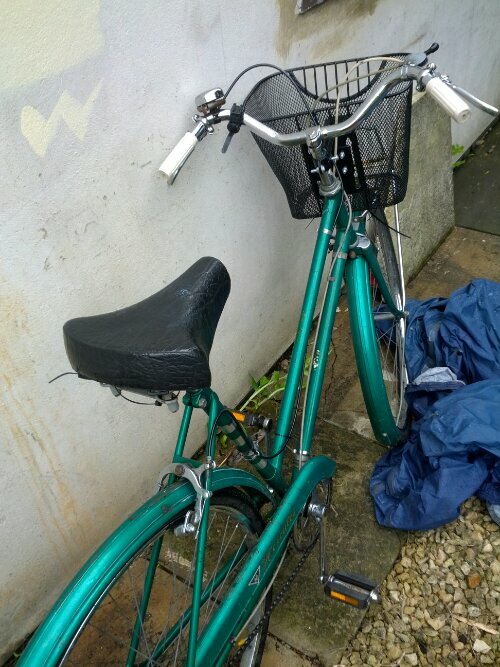 Mainly, there is no where to lock up your bike inside or near the station. As I had some time to wait for the train it might have been nice to go to the toilet, or queue up for the ticket machine without having to man handle my heavily laden bike into the small queue and not knock anyone over. Also, if there was more than two of us with bikes there would be no way we could all get into the lifts together to get over to the correct platform. As it was, I waited 10 minutes whilst others who also needed the lifts (wheelchair users, people with pushchairs and heavy luggage) used them first. It’s a good job I wasn’t in a hurry to catch my train at this station! Announcements is also somewhere that the station could help cyclists. They announce how many carriages, which letter carriage is at the front and which end of the train is first class…but no announcement of which carriage the bike storage was in. I asked a mildly helpful employee who told me it would be “somewhere in the middle” of the train. The train arrived and I ran down the platform with my bike as the cycle storage was at the far end of the train. Because a doorway is the best area to allow cyclists easy access onto and off the train. 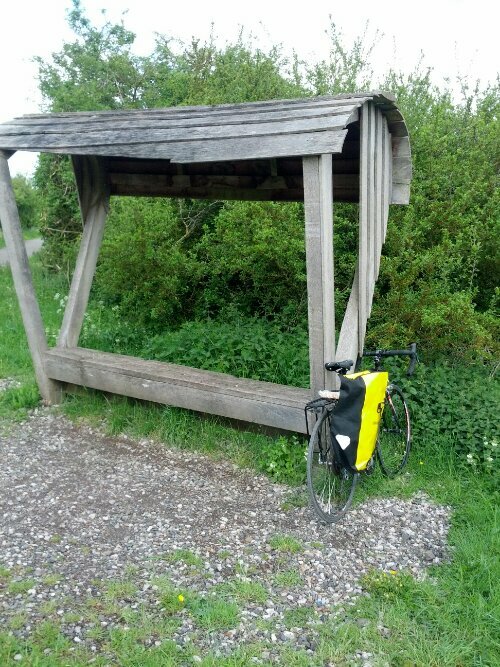 I came away from this experience a bit battered and bruised, but eventually the bike was on the train and I was ready to go and find my seat….easier said then done. The train was so packed that I found myself squished down a central aisle between lots of other people unable to find a seat. I waited until the train was pulling in to the next station and battled my way back to the door. On arrival I ran down the platform and jumped onto the carriage with my reserved seat. 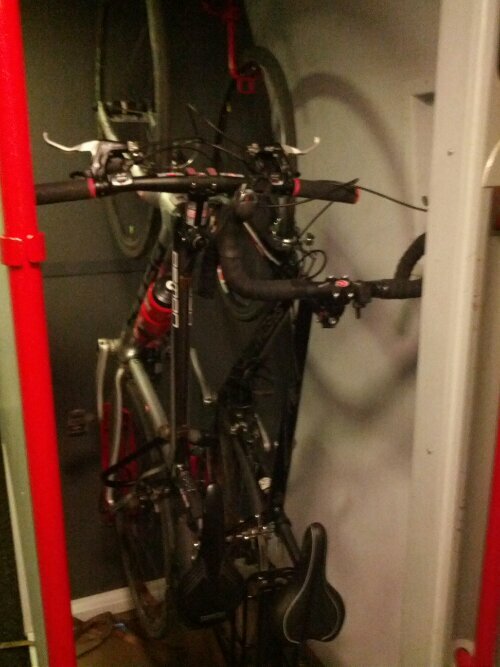 In an ideal world it would be nice if every carriage had bike storage, or even if there was bike storage and the front and back of the train. Unfortunately Crosscountry Trains don’t live in an ideal world, so as we approached Birmingham New Street station, where I needed to change trains, I had to battle my way back through the standing people from my seat at the front of the train, to my bike at the back. Unfortunately there was a delay in our arrival due to some pesky kids playing on the train track in front of us, not the fault of the train company at all. As we approached I quickly checked on my phone to see what platform my next train was leaving from, thank heavens for modern technology! On arrival in Birmingham I really began to discover what it must be like for anyone travelling with lots of heavy luggage or pushchairs, or for the millions of wheelchair users who must miss trains on such a regular basis that there’s little point in travelling by public transport. Getting off the train there were no signs that I could see telling me which way to go for the lifts. I followed a sign which said “other platforms” but this led to. I ran on for a bit more before I found the lifts and just managed to squeeze in my standing my bike up on one wheel and slightly terrifying a toddler in a buggy (sorry!). Looking for the next platform I quickly realised that I could see no signs for a lift to get down there, and realising I had about one minute before the train was departing I flung my heavy pannier bag over one shoulder and grabbed my bike with the other arm and ran down the escalators Getting on to the very long platform I was hurried by a staff member as the train was at the far end and I ran to where the bike storage was. Unfortunately the doorway was once again packed with people who stood and looked at me like I was crazy. I had to call for a member of staff who was incredibly annoyed that I was delaying the train, and this nice man yelled at the passengers to move out of the way so I could get on with my bike. I’ve taken a bike on a train before, and it’s fine when you are only going on one train, with no connections, and there is enough seats on the train that passengers don’t have to stand in doorways and block the cycle storage. Sometimes getting into the station and on to the platform can take a while, with the amount of lifts you have to get to get from one side to the other, but it’s really not too much of an inconvenience. 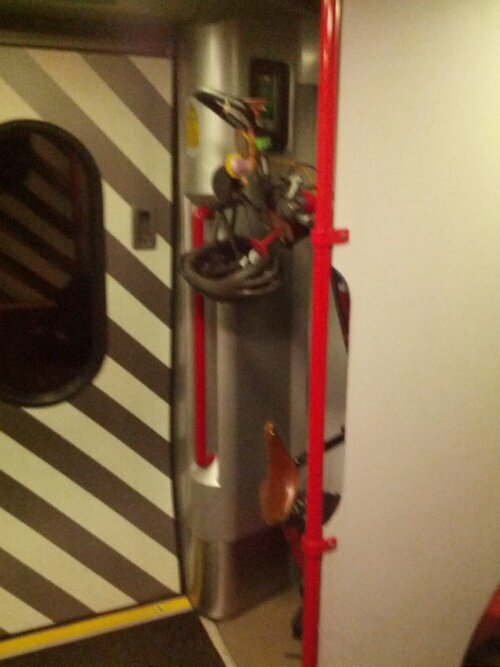 However, I would dispute the statements from most train companies that they encourage people to bring their bikes onto trains. In fact, I find this statement laughable. It seems train companies want to encourage people to use bikes, except when the trains are busy, or when there are more then three bikes (if Team Pedal were travelling by train we couldn’t reserve spaces, as most train companies only have two reservable spaces). 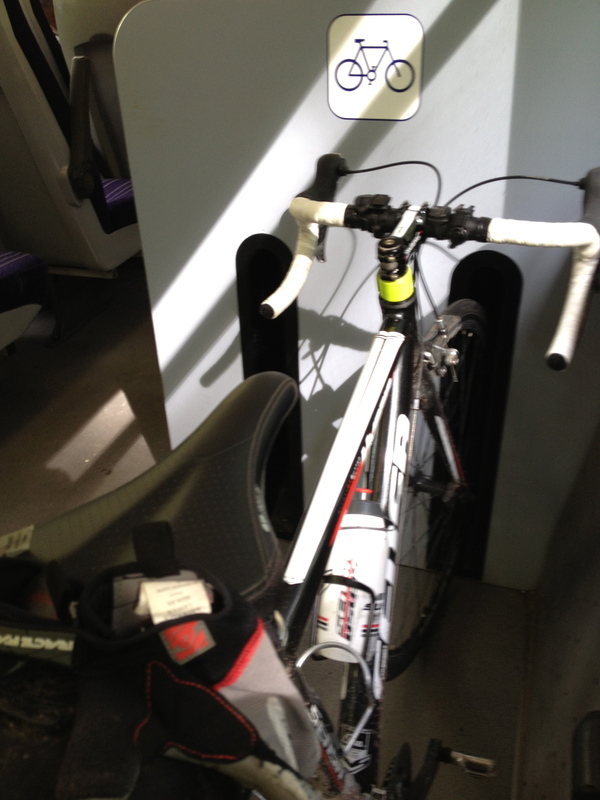 Taking my bike on a train is an option, I don’t have to do it and in future I probably wont unless I can’t avoid it. However, if instead of a bike I had to do this journey in a wheelchair, there would be no way I would have made that connection. I don’t know of any wheelchair users who would be able to get up, pick up the chair and run down an escalator with it! 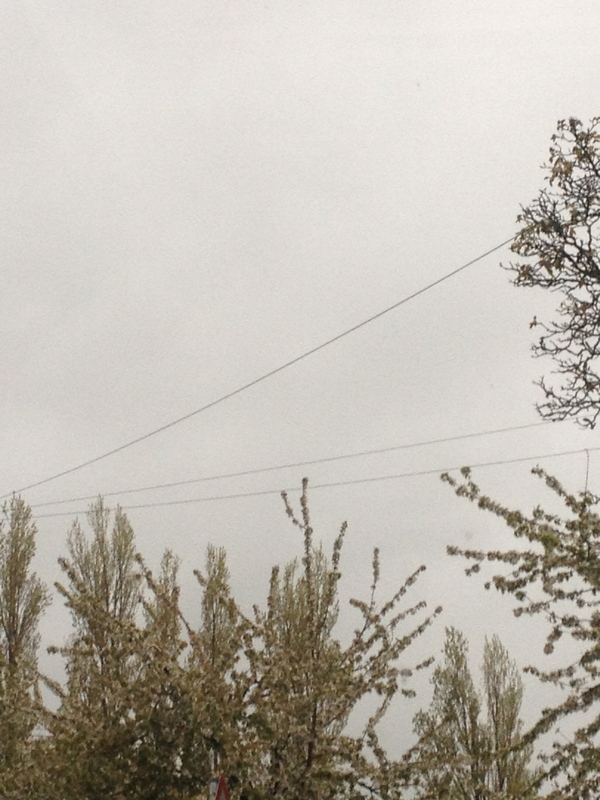 So, a disappointing end to the May Team Pedal training weekend. I was in charge of route planning and navigation, and was really excited about the route I’d planned down towards Stocksbridge and then all around Huddersfield, overall racking up 78 miles in good time. We set off, sans Jen as she was under the weather, in high spirits and I was optimistic that I could finally navigate a whole route successfully. 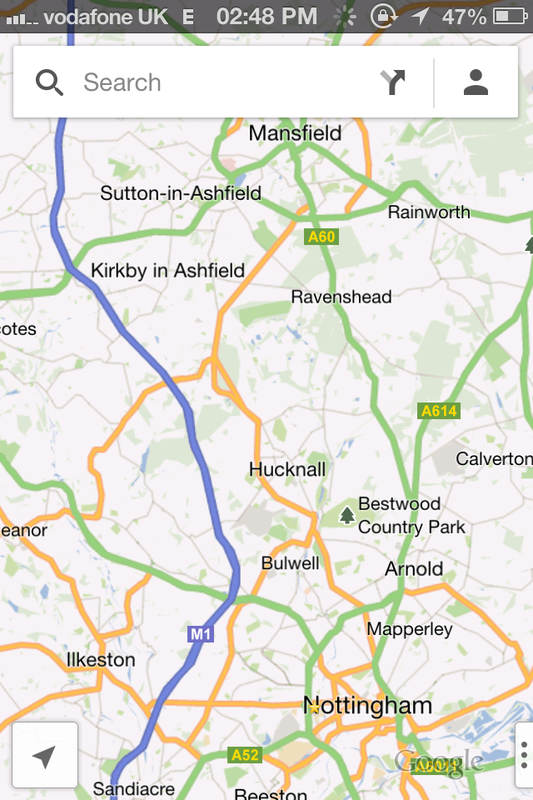 The first 7 miles were pretty easy as we followed the cycle route towards Dewsbury, and then we quickly got on our way following a few A roads, hitting a couple of hills, getting to a certain point then turning back to take the correct exit. It was an interesting morning and the route was proving to be quite enjoyable. Me and Ryan were just heading down an A road that connected the two villages we were cycling through, and came to a roundabout. I’m pretty confident with roundabouts, I enter them at speed , I’m comfortable with my signalling and this time was no different. Ryan was about 20ft ahead of me, already at the exit, and I was just rounding the roundabout signalling to exit and a car pulled out onto the roundabout without seeing me. From what I can remember I tried to veer back to hug the centre of the roundabout to get out of the cars way, but not fast enough, the car hit me and knocked me off my bike. Luckily, I was no worse off than a throbbing right side and a sore head, no broken bones or blood (aside from a slight cut to the ankle), but my bike , however, is in the wars. 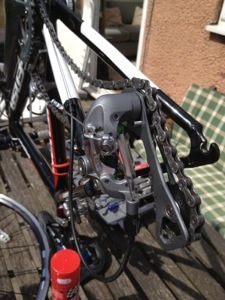 My rear wheel was pinned under the car causing it to bend, damaging the rear derailleur and the structure of the wheel. Yesterday was spent attempting to truer the wheel, but alas it has to be replaced, along with a new derailleur. A few more minor damages include my wind jacket and clippy shoes, they were ripped and damaged on the road, and over all my helmet… which has some pretty hefty cracks and dents in the structure. Jen made a very good point on the IMPORTANCE OF HELMETS when she pointed at the crack that now runs all up the right hand side and said: “see, imagine if that was your skull”. The thwack that my head made when it hit the ground (and this was only a very minor accident) was enough to freak me out and give me some rotten headaches for the next day, so thinking about the consequences of not having a helmet on for a fall like that is pretty scary. I’ll definitely be investing in another Giro Monza helmet again, thats for sure.